After spending most of my afternoon in the Greenwich Village neighborhood, I turned to the Find Me Gluten Free app to determine where I wanted to stop for dinner before catching an evening show closer to Times Square. 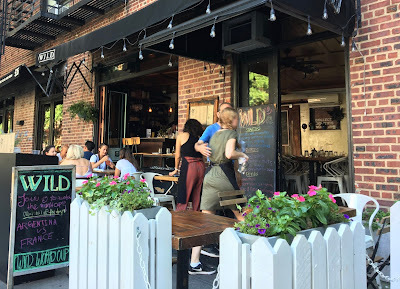 After looking at the options nearby, I decided to dine at Wild in the nearby West Village neighborhood because it had a decidedly different ethos. Believing in serving fare made with real ingredients in a way that is socially responsible and good for the environment too. Wild is a dedicated gluten-free restaurant, which to me meant that I could dine worry-free. Not only that, but they feature many normally off-limit options such as pizza, pasta, and even chicken parmesan (not dairy-free). With the heat of the day waning, I was excited to sit out on their open patio and dine al fresco on a sleepy Saturday. 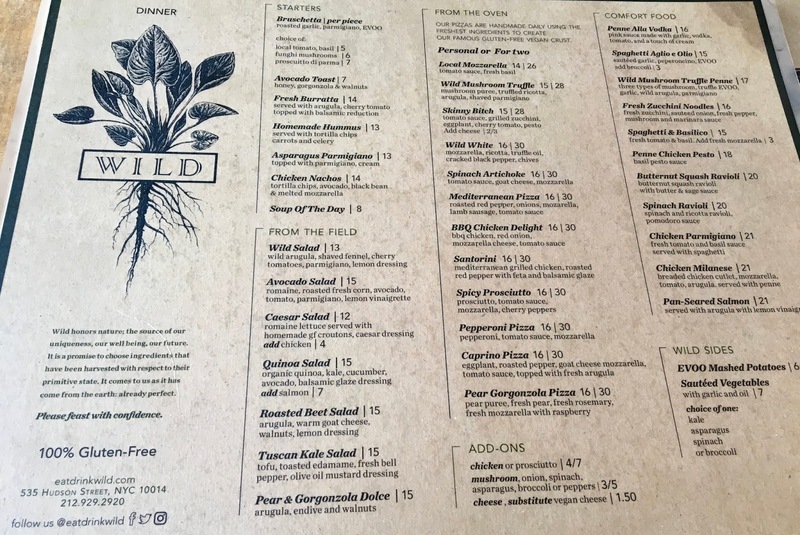 Wild's menu is 100% gluten-free, and each dish is crafted with care to ensure it features ingredients that are as good for you as they are delicious. They truly are a farm-to-table restaurant, and I poured over the menu relishing so many delicious-sounding options. Of course I couldn't pass up an opportunity to eat safe gluten-free pizza on Wild's "famous" crust (which is also vegan). Each pizza is handmade daily, so this pizza was definitely an upgrade on my usual homemade pizzas on a frozen crust. I decided to order the "skinny b*tch," which was naturally vegan and dairy-free sans cheese. Wild does offer vegan cheese for those who want to add it (or swap it in their other pizza options), but I am so used to eating cheesiness pizza that I did not order it on my pizza. 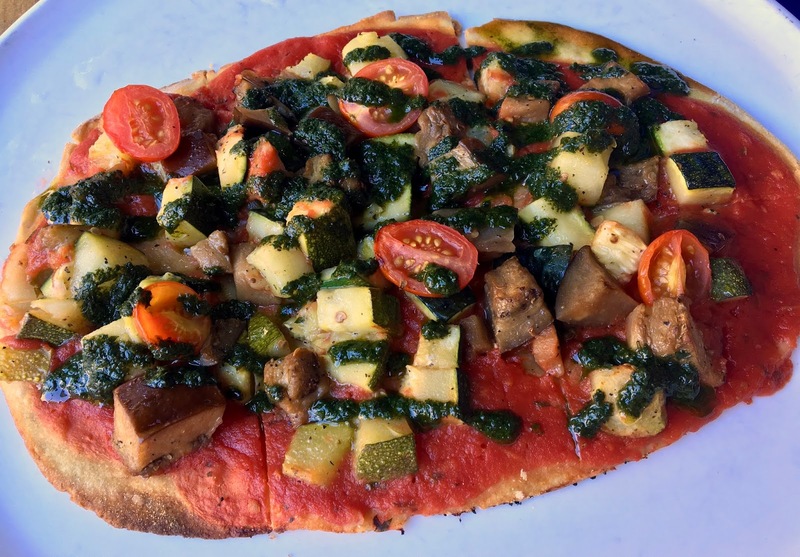 The pizza comes with a robust tomato sauce base, and is generously topped with grilled zucchini, eggplant and tomato. A drizzle of vegan pesto tops off the pizza, and the resulting effect is quite stunning. The crust is thin (it drooped a bit under the weight of the toppings) and was not as crisp as I'd like, but it had a good flavor and did not stand out as too soggy, flavorless, or cardboard-like, which is the downfall of far too many gluten-free pizzas. The vegetables atop the pizza are flavorful, adds concentrated pesto flavor. While I enjoyed the pizza as is, I wish I had ordered the vegan cheese, because this was the rare pizza where I missed the taste and texture of "cheese." That addition would have turned this impressive pizza into a true showstopper. Wild definitely scores points for their fantastic non-touristy location and for walking the talk when it comes to sustainably sourced and safe fare. It's the kind of place where anyone can find something safe to eat, and serves up rare comfort foods that are not often gluten-free. 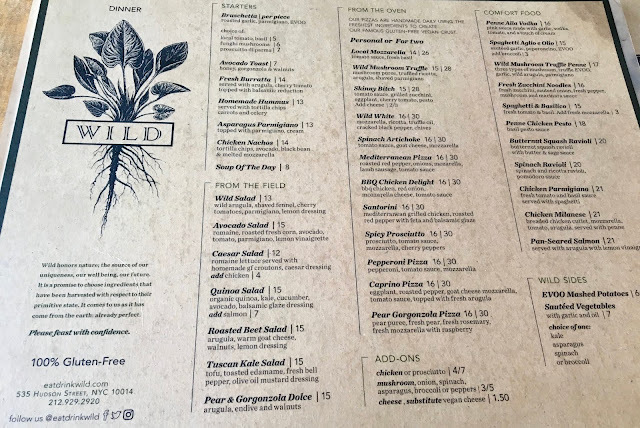 If for a few hours you can forget the daily grind of finding (and confirming) gluten-free options, Wild is a welcome oasis.